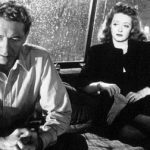 A review of “Jane” might seem an odd choice for a site that focuses on film noir. But here at FNB we also celebrate strong, independent women and anthropologist Jane Goodall, the topic of Brett Morgen’s National Geographic documentary, is certainly that. Goodall and Morgen appeared on-stage at a lovely screening Oct. 9 at the Hollywood Bowl with live orchestral accompaniment by Philip Glass. The event, which was open to the public, drew celebrities such as Angelina Jolie, Judd Apatow, Jamie Lee Curtis, Jane Lynch, Kate Bosworth and Ty Burrell. Goodall received hearty applause when she said we humans need to do a better job of taking care of the Earth. Morgen gave a shoutout to his mother because the screening date is also her birthday. Speaking of mothers, Goodall probably would not have achieved as much as she did had it not been for the steady support of her mom. In the film, Goodall explains that, as a young girl, when she expressed her desire to study animals in their natural habitats, her mother didn’t flinch; she encouraged Jane to pursue her goal. Later, she joined her daughter in Africa and helped out in their day-to-day living. The world’s top expert on chimpanzees, Goodall spent more than 50 years observing and documenting social interactions of wild chimps in Tanzania, starting under the guidance of Louis Leakey in the late 1950s. In the early 1960s, Dutch filmmaker Hugo van Lawick shot more than 140 hours of footage of Goodall’s work, documenting it for National Geographic. From this filmic record and original interviews, Morgen weaves together his subject’s fascinating life story, both public and private. With no college degree, Goodall tells us, her job qualifications were a love for animals and an open mind. (She later earned a PhD at Cambridge University.) As a leggy young blonde, she also courted a fair amount of media attention and not surprisingly caught van Lawick’s eye. They eventually married and had a child. “A lot of people have extraordinary lives, but not a lot of people can articulate those lives, and even fewer have had that entire life photographed on 16mm by one of the world’s greatest photographers,” Morgen told The Hollywood Reporter. Morgen, whose other credits include “The Kid Stays in the Picture,” “Crossfire Hurricane,” and “Cobain: Montage of Heck,” seamlessly captures Goodall’s passion and commitment, her gentle pragmatism, her quick wit and warm humor. We did, indeed. This wonderful film is a joy to watch. 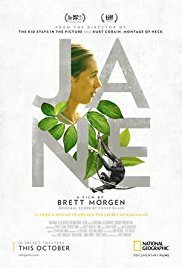 ‘Jane’ opens in Los Angeles on Oct. 20.